I love the regular size Beauty Blender so I'm definitely curious to try the mini for under eye concealer application. It can also be used to blend foundation in hard to reach areas like around the nose and your inner eyes. Though to be honest, I just use the pointy size of my the regular Beauty Blender and get those areas just fine. This is a gentle cleansing oil that dissolves mascara. The wand is more like a stick that makes it easy to apply the oil right onto your lashes. I'm definitely curious to try this. I was really happy to see this product in the box this month because I've been wanting to try this concealer. I received the shade Cool and it's not the best color match for me. I did try it though and it's really thick, but I could work with it. I will likely not buy this on my own, but I will probably use this sample a few more times before I make my final decision on it. 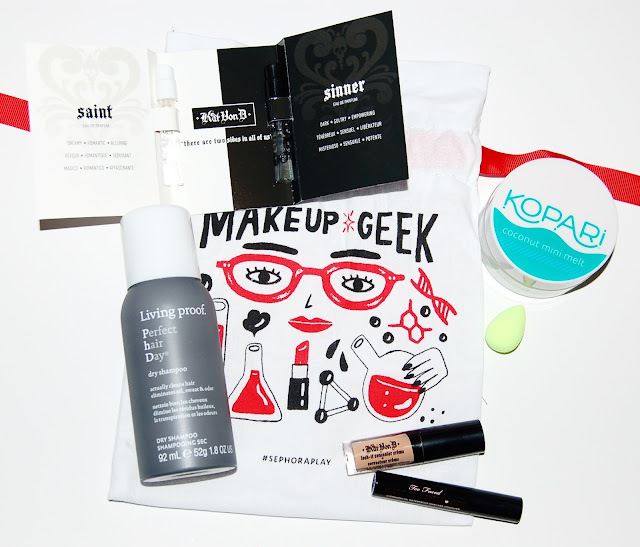 I just received samples of these from Influenster so I already know that I really like both, especially Saint. I will definitely use both of these samples. This is a great size "sample" and I was glad to see it in this month's box since we never get samples this big! I don't really use dry shampoo but this one has excellent reviews so I had to try it. It is seriously white! I massaged it into my hair a ton and it still left my roots looking gray. I'll have to play around with it a few more times. This is another good size sample that made me really excited! Hey Sephora, start including these sizes and you'll keep a lot more subscribers to this box! You rub this in your hands and apply it to your skin and hair, as a lip balm, and even as a makeup remover. I've never used coconut oil and the oiliness of it intimidates me (I know that sounds silly!). How do you like to use coconut oil? On your hair, skin, to remove makeup?? I think this was my favorite Play! By Sephora box ever! I love that we got 2 bigger samples and I will use every single product in this month's box.